Beyond the Reformation? sheds fresh light on divisive issues of authority in the Christian Church and puts them in a new historical and ecumenical perspective. Against the background of the perennial tension between the mystical and the institutional dynamics in the life of the Church, it goes beyond the tragic divisions of the Reformation era in two major ways. First, it examines the power struggles of the medieval period, the largely abortive attempts at reform, and the theological solutions to apparently intractable divisions that were proposed by the Conciliar Movement and enacted by the reforming councils of the fifteenth century. It shows how the legacy of conciliar theology was both continued and modified by the Continental and Anglican Reformers and how this has shaped the churches in the modern world. It examines the question of continuity and discontinuity in the Reformation, seeing that event as an unresolved argument within the family of the Western Church. But this book also seeks to move beyond the Reformation in a second way. Drawing on Roman Catholic, Protestant, Orthodox and Anglican theology, the book explores the theme of conciliar and primatial authority in relation to the ecumenical quest for reconciliation and unity in the fragmented Church of today. 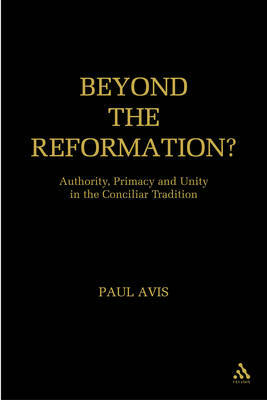 In this major, ground-breaking work, Anglican theologian and ecumenist Paul Avis adds to his repertoire of studies of authority in the Christian Church, brings together historical, confessional and ecumenical aspects of ecclesiology, and charts a course for convergence between the major traditions on the thorny questions of authority, primacy and unity.